illus. by Carolyn Gavin. 32p. diag. glossary. index. Kids Can. Apr. 2019. Tr $17.99. ISBN 9781771388047. Gr 3–5—In this nonfiction installment, Hickman and Gavin present a scenic picture book about trees in the United States and Canada. 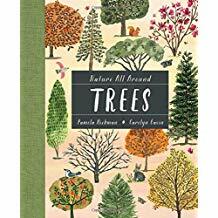 This picture book is similar to a guidebook, breaking down scientific facts about each tree and allowing readers to see each piece that makes a tree grow with realistic watercolor and goauche diagrams. From the sprouting of a seed to a tree's life throughout the seasons, children are shown every aspect of trees in great, colorful detail. The book offers a table of contents, activities throughout, a glossary, and an index. Although the amount of information can be overwhelming, the facts are broken down into paragraphs and bullet points for older readers, while the beauty of the illustrated diagrams and activities will engage younger readers too. VERDICT Classroom teachers, school librarians, and fans of Hickman's previous books will enjoy this lovely, informative volume.